1) It’s much simpler than you might think. 2) It’s possible to flat hunt without speaking Japanese. 3) You can get what you want if you really, really want it and are prepared to search/fight for it. With less than two weeks before starting Japanese school, I was keen to find a flat. No-one wants to be juggle new classes in a new environment with tramping around properties and picking over contracts. I started the process early, spamming English listing sites and trekking to four flats with a Japanese ‘buddy’, who had kindly volunteered herself for the task. 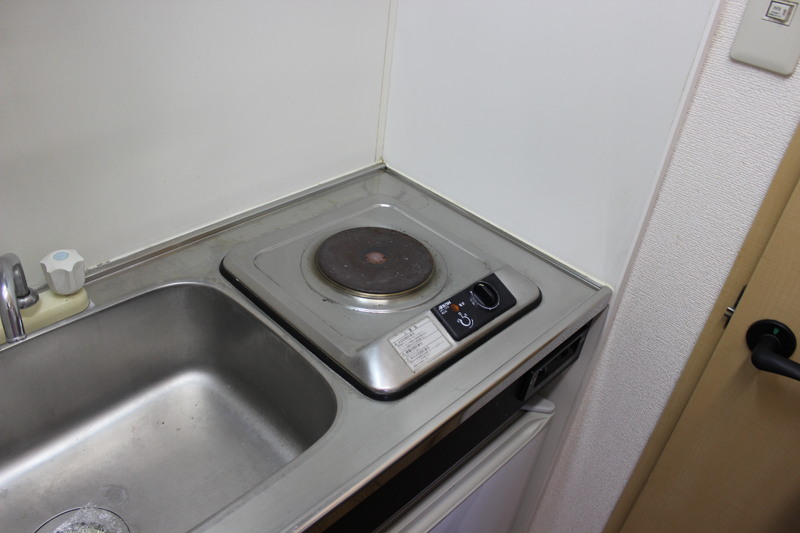 Standard kitchen (fortunately not mine) – one hob, no sideboards, no space for fridge. 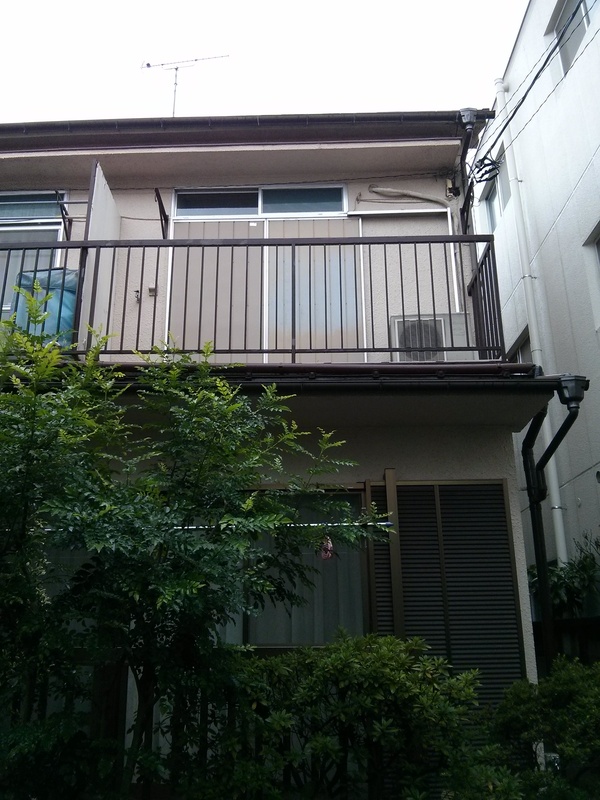 As it turns out, flat hunting in Japan is actually incredibly simple. I don’t mean it’s going to be easy, especially if you have specific requirements, but the entire process is so efficient that you could walk in off the street, view a few properties and sign a contract within a few hours if you wanted to. 1) The flat must be bright. Many apartments in Japan are wedges within apartment blocks – long and thing, with one large window at one end acting as the only source of light. I wanted ideally more than one window (ie. a corner property) on the second floor or higher to let in light. I was in a womb once for nine months – I didn’t want to spend a further 19 months cooped up like that! 2) I must be able to see at least one tree from my window. Nature makes me happy; please see the biophilia hypothesis. 3) The windows must be CLEAR GLASS. In Japan, the vast majority of windows are frosted glass – what they call “smoked windows”. I was told this is because of “privacy”/”Japanese are shy people”; the idea of net curtains/blinds leaves them cold. It’s a vast cultural difference. But I wanted clear windows. And I was going to get clear windows. Having viewed over ten flats found a beautiful flat at the very upper end of my budget range, I wondered if I could do better. 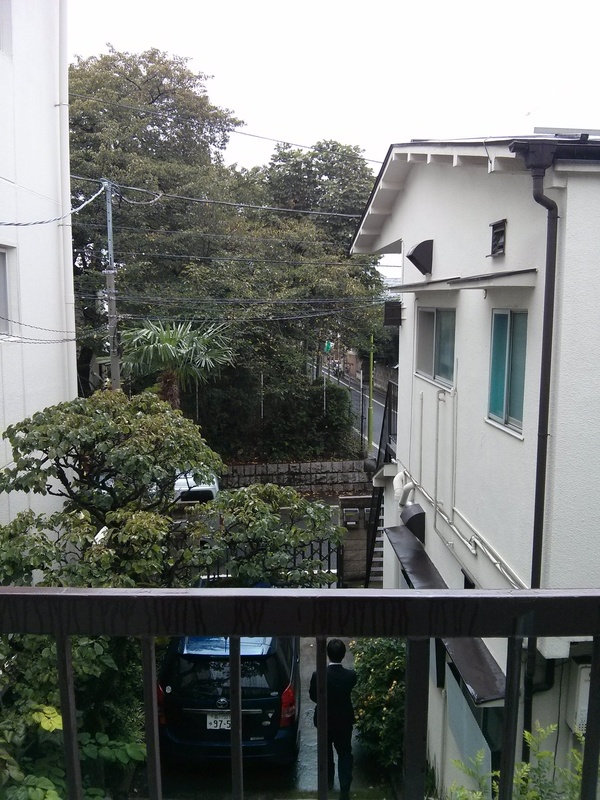 I caught the train to Shimokitazawa and walked into the first estate agents I saw. With my broken Japanese, the aid of a biro and Google translate, we communicated enough to see some properties. After four hours, I wasn’t that keen, and so I got up, walked 30 seconds down the road, and sat down in another office. Things got off to a good start as I noticed that the man helping me to fill in my form was rather tall and good looking. Given that I didn’t understand much of what was going on, I decided to gawp at him instead. Another man took over and after some more form filling, Google translating and a few miscommunications, I was shown a flat that was perfect on paper, save one thing: frosted windows. The estate agent said that we might be able to plead with the landlady to change them if I said I really liked it. And I did. A corner property, second floor, 22.86 sq metres, large kitchen with two gas hobs and a grill (most flats don’t even come with lights, let alone a cooker), a quiet area, and a view of CHERRY BLOSSOM TREES from my balcony. A view that was only visible with the windows wide open. My view – cherry blossoms! We went to knock on the landlady’s door. An elderly lady answered, who seemed genuinely warm and pleased to see me. “I don’t speak Japanese. So together we can practice!” I laughed. She said yes! I’m having to pay twice, because she’s going to change them back as soon as I leave. This means I can only afford to change two panels but I don’t care – I’m going to see the trees! Plus my rent is about half what I paid in London – who would have thought that Tokyo is so much cheaper? I was sitting at the desk, elated by the news that I wasn’t going to be homeless, when the tall estate agent guy showed up again. I sat there willing him to come and pay me some attention. That was the first and probably the last time in which silent flirtation has worked for me. But I’ll definitely use this in a book and laugh at the people who tell me off for a clichéd plot. Congrats! Soooo lucky with the trees too! My flat’s ground floor and has the loveliest view of gas heaters too close for modern regulations and gravel xD Shimokitazawa is the best! There’s a crepe stand somewhere in that area by a bakery that sells tofu if you can find it!!! Ooooh a bakery that sells tofu? Wow! The area changes so fast but I’ll keep an eye out for it! There is a taiyaki/croissant hybrid place that is crazy!